600 to 4,000 cu. ft. HFC-227ea and 3M™ Novec™ 1230 Models Available. 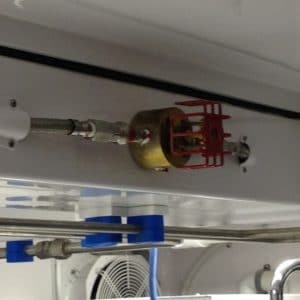 Fireboy’s GA link allows faster and easier installation with double check-valve quick-connects. This is the first pre-engineered system approved by the USCG for volumes over 1,500 cu. ft. 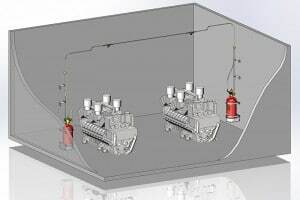 The Fireboy GA Series is a patented, pre-engineered total flooding fire extinguishing system for protecting larger boats with engine rooms from 600 cubic feet to 4,000 cubic feet. Two or four temperature sensors monitor the engine room temperature 24 hours per day. Two of the temperature sensors are located on the manifold blocks of the cylinders. The remaining one or two temperature sensors are installed above the engines and are linked to the extinguisher cylinders with the flexible hosing. 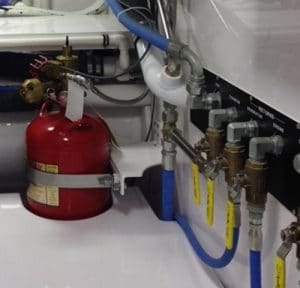 When the engine room temperature reaches 175°F (79°C) at any of the temperature sensors, the system will completely discharge the clean agent in less than 10 seconds to successfully extinguish the fire. No residue is left behind. To prevent accidental discharge during shipping and installation, each system is fitted with a patented safety-lock poppet valve. Installation is less costly and less time consuming compared to engineered systems protecting the same volume. Additionally, no costly third-party certification is required; all certifications are done directly through Fireboy-Xintex. USCG, Factory Mutual, RINA and Bureau Veritas approved. Each GA Series system is fitted with a “GA Link” which is flexible, braided 316 stainless-steel hosing with double check valve quick-connect couplings for easy attachment/detachment to the cylinder valve. When the system is armed, the link is highly pressurized. If the temperature reaches 175°F (79°C) at any of the temperature sensors, a drop in pressure occurs, triggering discharge of the system. The flexibility of the GA Link allows for easier installation. No complex piping is required as with many engineered CO2 systems, making the GA Series a viable alternative to more costly and labor intensive systems. 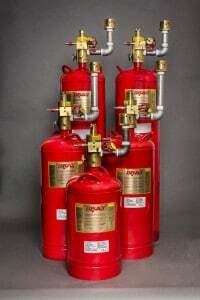 NOTE: Fire extinguisher systems not available online. Please contact Fireboy at 616-735-9380.